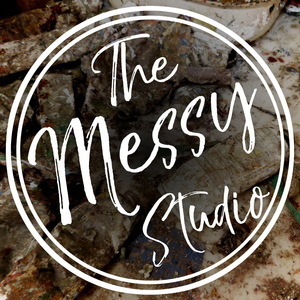 We found 10 episodes of The Messy Studio with Rebecca Crowell with the tag “rebecca crowell”. Rebecca sits down with her friend and fellow artist Sally Bowker. Sally worked for years with painting, drawing, photography, and mixed media. In her later years she has departed from these more tradition art forms to explore the world of digital media and Photoshop. Rebecca and Ross discuss common scams and schemes in the art world. Rebecca and Ross discuss the tricky business of how to value and price your work, unofficial rules of the art world and tricks of the trade. Rebecca and Ross dive into the nuts and bolts and explore the process of bringing experiences from unique settings into the studio. Rebecca returns from Spain and sits down with Ross to discuss the process of absorbing new places and experiences which can later be incorporated into artwork. Janice Mason Steeves joins Rebecca Crowell once again to discuss their workshop in Spain and the advantages of teaching, learning, and creating abroad. Janice also shares plans for her upcoming Workshops in Wild Places. Rebecca Crowell and Janice Mason Steeves discuss their adventures in Spain, the local environment and spiritual culture, and the workshop they will be teaching. Rebecca and Ross discuss what draws people toward particular forms of expression and how to choose your own path. Rebecca and Ross talk about important ways that working in series can enhance the creative process.